After a lifetime of perfecting his classic Indian motorcycle, Burt sets off from New Zealand to clock his bike at the Bonneville Salt Flats. With all odds against him Burt puts his kiwi spirit to the test, braving the new world on a shoestring budget. 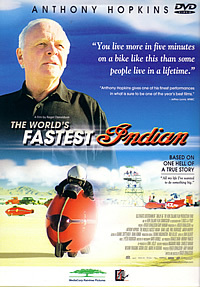 Burt’s quest culminates in an unlikely conclusion and remains legendary within the motorcycle community to this day. Put a great actor like Sir Anthony Hopkins in a character-driven story and he will make it a great film. Throw in a rackety motorcycle, some nice folks and a cute boy and you get this quaint little story that, quite like its protagonist, over-achieves and inspires. The protagonist Burt Munro is this charming old coot that always says the right things at the right time, be it to make friends with the most unlikely of folks or to weasel his way into the sheets of lonely old women. What makes him the hero in this story is his steadfastness in fulfilling his dream. No big-talking or grand dramatic gestures for our hero, just putting in hard work, tucking your chin in and trudging forward. That’s Burt, and that’s why the movie works like a charm. Keep a lookout for the scene in which Anthony Hopkins tries to deal with a stubborn prostate problem at the flats. It is an absolute cracker. Inspirational true-life movies need no special features. The visual transfer is adequate and the movie is presented in Dolby Digital 5.1. The subtitles are really appreciated as the New Zealand accent can be quite dense at times. I don’t understand why the movie is displayed at 4:3 aspect ratio though.